Keratoconus in an eye disease that is characterized by thinning and steepening of the cornea. 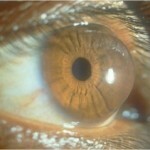 The cornea is the front surface of the eye and the most important focusing element of the vision system. In patients who have keratoconus their cornea is cone shaped. The name keratoconus is derived from the Greek word for cornea (‘kerato’) and cone shaped (‘conus’). Keratoconus results in visual distortion often not correctable by traditional glasses. The thinning and steepening of the cornea causes the front surface to become progressively more irregular in shape. The corneal surface irregularity is what induces the distortion and blurriness of vision experienced in keratoconus. Keratoconus is found in approximately one in two thousand individuals, and as such can be considered a relatively common eye disease. New, more sensitive diagnostic techniques will likely increase the prevalence rates of keratoconus found in future studies. There is strong evidence that keratoconus has a genetic basis. Though studies have shown variable rates of keratoconus among family members of patients with the disease, it is felt that significant genetic components do exist. There is virtually no gender predilection in keratoconus with equal incidence in males and females. Typically keratoconus is initially diagnosed just after puberty and can progress through the third to fourth decade of life, however individual cases can present at any age and progress throughout life. Keratoconus most often is found in both eyes, but commonly more advanced in one versus the other. Cases of true unilateral (one eye only) keratoconus do exist, however they are the rare exception to the rule. Commonly reported risk factors for keratoconus include: atopic allergic disease (when someone is highly sensitive to allergens), especially a history of eye allergies, and vigorous eye rubbing. The severity of the disease is quite variable. Some cases develop only to a mild stage and do not progress further. Patients with this form of the disease often can achieve adequate vision correction with the use of glasses or soft contact lenses. Other cases may progress significantly and result in dramatic distortion of vision which requires treatment with specialized contact lenses (typically rigid gas permeable, hybrid, or scleral lenses). The most advanced cases of keratoconus can develop corneal scaring and require surgical corneal transplantation. New medical technologies such as collagen corneal cross-linking with riboflavin hold promise for controlling progressive cases of keratoconus and aid in keratoconus treatment.